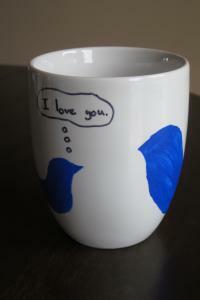 Decorating a mug is a great way to give a personalized gift or simply express your creativity. With a few simple supplies and some instructions, you can spend an afternoon crafting one-of-a-kind cups that are fun and functional. This adorable mug is an easy project to make for a holiday or simply to preserve a moment in your baby's development. It takes two people to make this craft, since wrangling the baby is the hardest part of the project. Start by wiping the surface of the mug with an alcohol wipe. This will remove any residue that could prevent the enamel from adhering correctly. Shake the enamel and squirt some of it onto the paper plate. You won't need a lot for this craft. Dip your brush in the enamel and carefully paint it onto the baby's hand. Work quickly and don't let the baby eat any of the enamel. Gently press the baby's hand straight down onto the cup and then lift it straight up off the surface. Set the cup down and immediately wash the enamel off the baby. It will come off easily with soap and water. Go back to the mug and use an alcohol wipe to clean up any areas where the handprint is smeared. The enamel will wipe right off, so work very carefully. 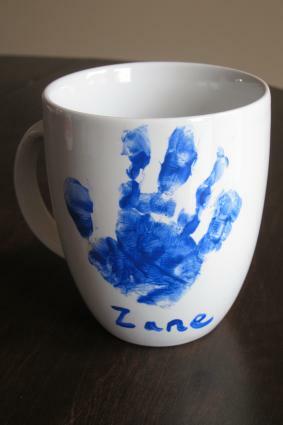 Use the paint brush to paint the baby's name or any other special message on the mug. Allow the mug to dry according to the instructions on the enamel, and then cure it in the oven according to the instructions as well. Typically, you'll need to put the mug in a cool oven and then turn the oven on to the specified temperature. You'll bake it for a half an hour or the time specified, and then you'll leave the mug in the oven to cool down. This keeps the ceramic from cracking due to sudden temperature changes. When the mug is cool, you can hand wash it or wash it in the top rack of the dishwasher. Everyone loves making a hot drink to enjoy on a chilly day, but you don't always have the recipe handy. For a cute gift, create a custom mug with the recipe right on the side. You can fill it with the ingredients needed and present it to the recipient as a kit. For best results, use regular Sharpie markers for this project, rather than oil-based Sharpie paint markers. Wipe the mug with one of the alcohol wipes to remove oils and other residues that might interfere with your project. Allow it to dry. 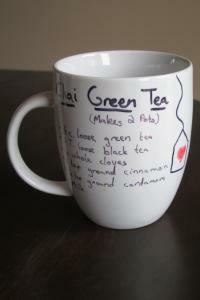 Using the Sharpies, copy the recipe directly onto the mug. Add little drawings to make it extra cute. Be careful not to touch the places where you've already drawn or written, since they will smear easily. If you make a mistake, simply wipe off the Sharpie with an alcohol wipe. Allow the mug to dry completely for at least one hour. Then place it in your cold oven and turn the temperature on to 350 degrees. Once the oven comes up to temperature, set the timer for 30 minutes. At the end of the 30 minutes, turn the oven off, leaving the mug inside to cool down slowly. Once the mug is cool, repeat this heating process to help the design hold up better. After the second time in the oven, take your mug outside or to a well ventilated place. Put it upside down on a protected surface and spray a light coat of finishing spray over the design. This will help make it more durable. Allow the mug to dry according to the instructions on the spray. Hand wash your mug or wash it in the top rack of the dishwasher. You can easily buy stencils at any craft store, but for a personalized design, it's fun to create your own. You can make any design you want, from the simple bird motif shown here to more complicated monograms and intricate patterns. Begin by wiping the surface of the mug using one of the alcohol wipes. Let the mug dry completely while you make your stencil. Place a few pieces of blue painter's tape on the waxed paper, carefully overlapping the edges of the tape as you go. Make this tape area no larger than the height and width of the mug. Draw your design onto the tape. Start with a simple shape to perfect your technique, but later, you can try lacy motifs or other intricate designs. Cut out the center of the design. Use care not to snip outside the lines you made, since the outer part of the design will be your stencil. Discard the inner part. Carefully peel the painter's tape off of the waxed paper. Don't allow the tape to stick to itself, or it will destroy your work. Starting from the center of your design, apply the stencil to the mug. If the mug is curved, you'll need to decide where you want the stencil to fold to accommodate the change in shape. Use your fingernail or the side of a butter knife to make sure all the edges of the stencil are well sealed to the mug. Squirt some of the enamel onto the paper plate and use the paintbrush or pouncer to apply it to the mug. Cover the entire area. While the paint is still wet, carefully remove the stencil and throw it away. Use an alcohol wipe to clean up any areas where the paint bled under your stencil. If you desire, add additional details with a Sharpie marker or paintbrush. Allow the paint to dry according to the instructions, and then bake as directed on the bottle of enamel. Once the mug is cool, you can wash it by hand or in the top rack of your dishwasher. Whether you choose the oven-baked Sharpie technique, a stencil, or another method to decorate your mug, this is a fun craft project for the whole family to enjoy. If you take care in washing your creations, your mugs and their one-of-a-kind designs will be fun to show off and enjoy for a long time to come.